Carol Phillips is plugging away at the cover for Book V: The Temple of the Exploding Head and it’s coming along nicely. 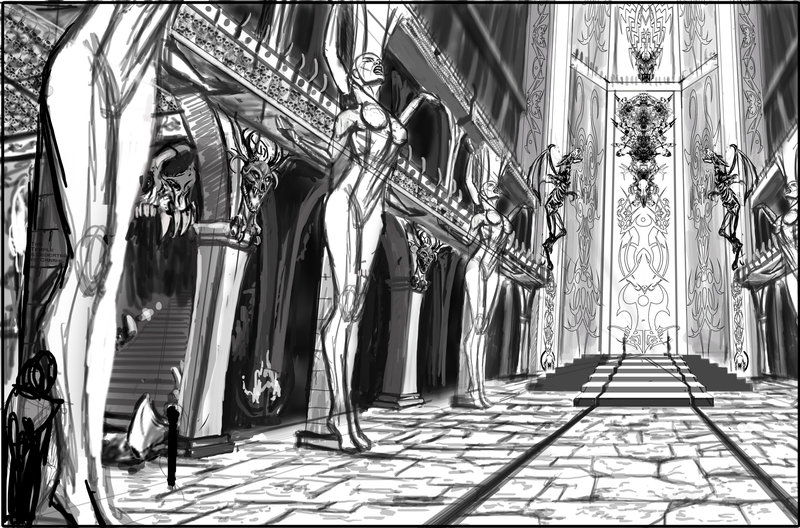 She has the main interior laid out, complete with central dais, pillars, Berserkacide statues and skulls. I’m hoping to convince her to make the back wall nothing but skulls. I was concerned a bit about the width–the Temple is a half-mile wide, however, the composition gives the impression of a rather narrow space, like a cathedral. There is clearly more Temple beyond the pillars and arches, so I can live with the more narrow central area. I love the impression of lofty heights that Carol gives the Temple–too bad most of that will be covered up with dark clouds. It rains inside the Temple. And, last but not least, the Horned God Himself. Oh, I can’t wait for this cover–it should make for a memorable conclusion to the TOTEH trilogy. It’s already great. I don’t know how she will ever fit all those things in there! This artwork is awesome–a story all its own!I’m really excited to read the two remaining books of TOTEH, and think the cover is going to rock!